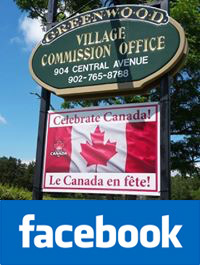 The Village of Greenwood would like to extend greetings to our residents and a warm welcome to all newcomers to the area. Please feel free to visit our village office at 904 Central Avenue, the staff is more than happy to serve you. Located on Route 201 and just 3 kilometres off the 101 Highway, south through the Village of Kingston, can be found the thriving community of Greenwood, home to the largest Air Force Base in Atlantic Canada. The Greenwood Military Aviation Museum is a must for anyone with ties to the military who may be traveling throughout the area. Greenwood Mall has over 50 shops to choose from, including Roo's a giant indoor play area for children, as well as the attached strip mall anchored by Walmart. Recreation activities are available through 14 Wing Community Centre on Church Street which operates the outdoor pool and playground. The Fitness and Sport Centre on the Base is accessible to the public for a membership fee. Many recreational activities are available through various clubs at 14 Wing Greenwood. As a prelude to Canada Day celebrations on July 1st, Greenwood welcomes all to the annual Fireworks display, which takes place at the Civic grounds on Central Avenue. Come out and join us in Fun, Food, and Fellowship as we celebrate our nation's birthday. Our world is changing, and Kings County is changing with it. The Municipality of Kings has published 'draft for consultation' planning policies and zoning maps that guide where and how development takes place. Read more, view maps, and tell us what you think.